On the last days, I had to fight a lot for the respect of the license of Pepper&Carrot (because of a project on kickstarter). Today the author of this project contacted me to announce he closed his page. Good! And now, what to do ?... I decided to spend the last 24h working on something creative, a new project, let change a bad experience into a positive one! 82 pages and all episodes published so far. This is to send a big thank you to all the Pepper&Carrot community. Also the repository is now more open (fully CC-By), allows multilangue and still here on git (collaborative) and ready to launch for any publishers. License: CC-BY-NC-ND David Revoy, www.davidrevoy.com, 20 january 2016 . Will the printed version itself and/or the print layout be under a free culture license after the print run is done (I understand wanting to protect these assets until then, to protect the print run) or will these extras remain NC afterwards also? Were you involved in Vol 1 of the printing? If not, I'm kind of appalled I supported it, and I was very disappointed in what I received. It was -awful-. Fuzzy, cropped, just terrible. Yes, as soon as this project will be finished and printed, all sources, cover elements, design, etc will be released as CC-By. Thank you for your comprehension of this special 'work-in-progress' protection. In regard to the original issue. I think the pressing problem with the kickstarter was one of trademarks, or not so much marks but trade name misappropriation. In effect it capitalised on the good name you have built in order to deliver an inferior product which has very likely damaged your reputation without any recourse to yourself. I think you mentioned that issue on G+ but I think it bares enboldening. There is a system which is under used http://questioncopyright.org/creator_endorsed_mark the creator endorsed mark. Not something people are aware of much, but maybe something you would be interested in educating people in via use in your publications? The issues of trademarks in open source software and media have not yet fully been resolved I think. I love that it's 'lucky' number 13 for the first volume, seems appropriate for a witch! As for all this nastiness, I think the best thing is how the community, in a positive way, was able to help. As an open source artist, you depend on the community instead of lawyers for this kind of thing, and I hope we all take this as an opportunity to further educate people about how win-win situations are possible. I am a very happy GIMP user and I like to see how you try to give something back to people who are offering great tools for free. Big big thank you for that, David! Seeing official Pepper and Carrot work being released under CC-BY-NC is quite... Disappointing. How the translators and patreons feel about their work or money being put in to a nonfree project aside, it feels almost like a loss for free culture given one of the biggest names is now using nonfree licenses. The nonfree use is justified by "This is a protection to assure this project will be only printed and sold for this good action. ", meaning this work is no longer able to be used for any action, just the one you're intending for. What's it protecting against? Even if it were CC0 the printing and fundraising could still go on, so this is plain restriction of use. Someone selling the PDF or printed copy, someone hosting it online with ads to keep the site going, anything 'commercial' is now gone. After the fundraiser and printing apparently it'll all be put up as CC-BY - so what's the point then? People who actually shell money out for a good cause get nonfree culture while anybody who wants to print it at home or download it get free culture. Is this fair? I don't think so. It also sets a precedent showing that free culture isn't good for fundraising these types of things, and there's no reason why that is. It seems like David's a bit shocked from the Kickstarter campaign and I want to think this is a reaction to this, but if David of all people can't make free culture work, then who can? I think you shouldn't see this as 'non-free' licensing @jookia, that argument taken to its extreme would have us ask why David doesn't just public domain things straight away. CC-By-NC is still open, just a different kind of open appropriate for different contexts. I would look at this as a continuation of his policy of protecting works in progress. Sketches and roughs are shared with translators, but not 'open' fit reshare, this is to protect the work in progress until it is polished for final consumption, at which point it's opened up. 1. Create rough draft with more restricted source. Thank you also for this "Creator-Endorsed Mark logo". This is a good solution, I need to study it in detail, and see how I can communicate about it. Hi Jookla. Your accusation on your comment are grave. The accusation you wrote even hurts me. Your understanding of CC rules are really far from the official text and can be dangerous: the ideas you use of "non-free", "relicensing (stealing) the work already done by contributor" and "pad-locking everything" are things not even possible. 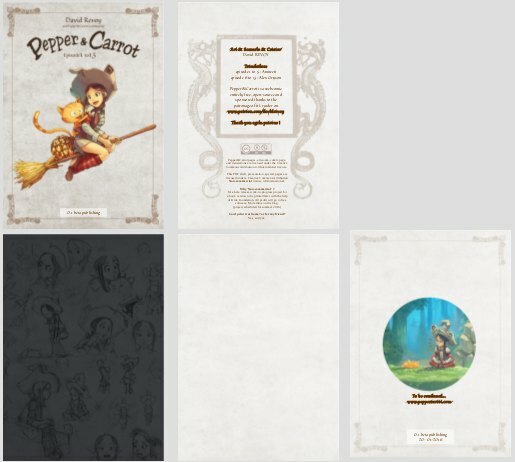 ❖ All comic pages of Pepper&Carrot, all artworks of Pepper&Carrot inside this PDF for a print project are still licensed under CC-BY 4.0. (Attribution to David Revoy for the artwork, and to the two translators written on page 3 for the English translation and corrections of the comic pages) This is not something I can 'revoke' or re-license. Never. The pages, the translation sources are still on the 'Sources' page of this website, you can use them for free and even for commercial usage following the rules of CC-By. I can't re-license this work to something more restrictive. I can't add restrictive rules or revoke a work released as CC-By. This artworks are open-source, free, and will still be. Translators, patrons, supporters and community knows it. My only eventual possibility would be to remove a CC rules. ( eg. for CC-By it would mean the only upgrade possible of license to be removing the 'By' and go CC-0/Public domain, and I'm not interested by CC-0/Public-Domain for Pepper&Carrot). So, nothing is suddenly non-free, all is still as it was. Again your accusation were very grave, and leading to confusion. ❖ Now about the "non-commercial" creative commons tag ( CC-By-Nc ). I added this tag for the pages in the 'printing sub-project'. This tag limit the commercial usage only of the PDF as it is. It means limiting 'making money' with a product. The product here is the PDF as I released it in this article yesterday ( 96ppi and 300ppi). The PDF is still free to read, to share, to use, to re-post, to re-host, to show in Youtube videos (derivation)... etc... but all for non-commercial usage. There is nothing related to 'non-free' here. You can still go to the 'sources' page, make your own PDF with own cover from one of my artwork and sell it with the appropriate attribution to the translators and artworks. The 'CC-By-Nc' parts in this PDF applies to the 'Shell' of the PDF (5 pages so far : the cover, introduction page, back-cover). This elements were done re-using CC-By artworks available on this website. They were arranged into a special design. This design I want to label it as the 'official design' for a printing project of Pepper&Carrot. This print project is scheduled in Summer 2016 and will be a non-profit project to give money to 'upstream' software and org. That's why I'm protecting the 'official cover and design' under CC-By-Nc during the production time. The PDF is still in a 'beta 0.1' step. I'll keep making it better and better, and release other version till summer 2016. As soon as the project will be printed, this design/shell ( finished ) will be released/upgraded as full CC-By. This method assure me no-one will 'print' the unfinished beta version and sell it, and I'll be able to take time to polish it. I'm open for more details and answers. But please, ask before writing such strong accusation. They are devastating. Thank you. Yay, this is amazing! 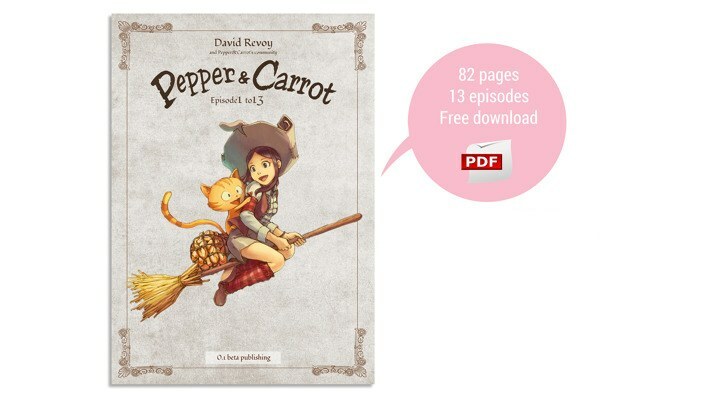 I'm eager to get Pepper&Carrot on my bookshelf :) Keep up the good work! Il va y avoir une version française ? Je suis impatient d’en entendre plus ! Je le veux dans ma bibliothèque ! Si par hasard c’est par framabook que ça passe, je trouverais ça vraiment classe ! Bravo pour la manière dont tu te sors de cette mauvaise passe, avec panache ! @Amic : Merci Amic 😃 La version française sera un projet d'une envergure nationale en libraries. (teasing) Mais je n'en dis pas plus, c'est pour été/rentrée 2016 dans les discutions, et les contrats ne sont pas signés encore donc ça porte malchance d'en parler. Merci pour les encouragements. I go by the term 'nonfree' which has a very specific definition- the freedom to share, sell, copy, modify and read. This is a bit like free software. CC-BY-NC is a nonfree license in that you can't do all those things. You can still do these things with CC-BY or CC-BY-SA. I have nothing against closed development as long as everyone has a freely licensed copy. This isn't an argument about open or closed, it's about free and nonfree since that's what affects the reader or remixer. I really didn't mean to hurt you, I think you may have misread my post! I never said anything about relicensing, padlocking, revoking or anything like that at all! My gripe here is that Pepper and Carrot, a free culture comic, is officially on board with using a nonfree license (CC-BY-NC) for this content you've created and released to people. - You're uneasy about it too. - This is only for the work and progress PDF. - We're all pretty shocked about the Kickstarter. - The final prints people will get will be CC-BY. I suppose my fear was that this wasn't a big deal or it was a decision taken lightly. This is in part from seeing a lot of music artists doing free culture then moving to nonfree models for their projects. It was mean of me to assume you didn't take these values as seriously as I do, if not more given you build your livelihood on it. It'd be very interesting to see if we could find a free culture solution to having 'legitimate' prints rather than making the works nonfree, in that people can't fork it. I think the creator endorsed mark is an interesting idea so that if people did want to take the beta and print it commercially they could as long as they removed any endorsement, though I'm not sure. I certainly hope you share my concerns (and probably a lot of readers' concerns) about this tradeoff. >> You're uneasy about it too. >> This is only for the work and progress PDF. >> We're all pretty shocked about the Kickstarter. >> The final prints people will get will be CC-BY. +1 totally, we are on the same page. Bravo, I love the way you keep pushing forward to promote the software that enables you in a very nice circle. You help them, they help you, and you pull others into a artistic and free ecosystem of sorts. I am very grateful to have stumbled onto your work during your time with Sintel, and I still watch the Blend and Paint dvd at home for inspiration. As a fellow artist inspired by your work, it's great to see that you're dealing with this problem in a very well-thought way. I only read recently about the Kickstarter problem, and this scam (even if the rules "allow" it) got me really sad.